Row 7: Knit 3, purl 30, knit 3. Row 9: Knit 3, purl 30, knit 3. Row 10: Knit 7, purl 1, knit 15, purl 1, knit 12. Row 11: Knit 3, purl 5, knit 1, purl 24, knit 3. Row 12: Knit 5, purl 1, knit 3, purl 1, knit 7, purl 2, knit 11, purl 1, knit 5. Row 13: Knit 3, purl 7, knit 1, purl 6, knit 2, purl 4, knit 1, purl 9, knit 3. Row 14: Knit 7, purl 1, knit 9, purl 2, knit 3, purl 1, knit 13. Row 15: Knit 3, purl 6, knit 1, purl 7, knit 2, purl 14, knit 3. Row 16: Knit 10, purl 1, knit 6, purl 2, knit 10, purl 1, knit 6. Row 17: Knit 3, purl 14, knit 2, purl 3, knit 1, purl 10, knit 3. Row 18: Knit 7, purl 1, knit 9, purl 2, knit 6, purl 1, knit 10. Row 19: Knit 3, purl 10, knit 1, purl 3, knit 2, purl 14, knit 3. Row 20: Knit 4, purl 1, knit 12, purl 2, knit 12, purl 1, knit 4. Row 21: Knit 3, purl 14, knit 2, purl 14, knit 3. Row 22: Knit 5, purl 1, knit 3, purl 1, knit 7, purl 2, knit 5, purl 1, knit 11. Row 23: Knit 3, purl 14, knit 2, purl 14 , knit 3. Row 24: Knit 17, purl 2, knit 17. Row 25: Knit 3, purl 3, knit 10, purl 1, knit 2, purl 1, knit 10, purl 3, knit 3. Row 26: Knit 6, purl 24, knit 6. Row 27: Knit 3, purl 4, knit 22, purl 4, knit 3. Row 28: Knit 8, purl 8, knit 1, purl 2, knit 1, purl 8, knit 8. Row 29: Knit 3, purl 14, knit 2, purl 14, knit 3. Row 30: Knit 17, purl 2, knit 17. Row 31: Knit 3, purl 6, knit 7, purl 1, knit 2, purl 1, knit 7, purl 6, knit 3. Row 32: Knit 8, purl 20, knit 8. Row 33: Knit 3, purl 4, knit 22, purl 4, knit 3. Row 34: Knit 6, purl 10, knit 1, purl 2, knit 1, purl 10, knit 6. Row 35: Knit 3, purl 3, knit 9, purl 2, knit 2, purl 2, knit 9, purl 3, knit 3. Row 36: Knit 17, purl 2, knit 17. Row 37: Knit 3, purl 13, knit 4, purl 13, knit 3. Row 38: Knit 16, purl 4, knit 16. Row 39: Knit 3, purl 3, knit 1, purl 10, knit 2, purl 7, knit 1, purl 6, knit 3. Row 40: Knit 6, purl 1, knit 10, purl 2, knit 6, purl 1, knit 10. Row 41: Knit 3, purl 13, knit 1, purl 2, knit 1, purl 13, knit 3. Row 42: Knit 9, purl 1, knit 5, purl 1, knit 4, purl 1, knit 3, purl 1, knit 5, purl 1, knit 5. Row 43: Knit 3, purl 12, knit 1, purl 4, knit 1, purl 12, knit 3. Row 44: Knit 6, purl 1, knit 4, purl 1, knit 14, purl 1, knit 3, purl 1, knit 5. Row 45: Knit 3, purl 30, knit 3. Row 46: Knit 8, purl 1, knit 14, purl 1, knit 4, purl 1, knit 7. Row 47: Knit 3, purl 15, knit 1, purl 12, knit 1, purl 1, knit 3. Row 48: Knit 6, purl 1, knit 5, purl 1, knit 7, purl 1, knit 5, purl 1, knit 9. Row 49: Knit 3, purl 3, knit 1, purl 10, knit 1, purl 8, knit 1, purl 6, knit 3. Rows 50 - 54: Knit. Made this dishcloth from your pattern- thanks for sharing it! this is my next project thx. Oh I love this - thank you so much for sharing! i like your own creating ,it's therefore understandale ,pleasurable and easy to learn .. thx . Lovely Dragonfly Cloth! Thanks so much for sharing the pattern with us, Judith. I can't believe all the junk comments you get! 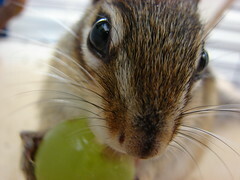 Unbelievable that so many people have nothing better to do than post useless gibberish on blogs! 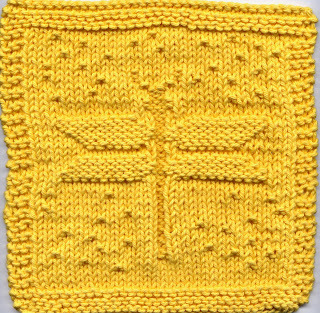 Love the idea of putting dragonflies on the dishcloth! I need to make one of these... just for something more interesting than plain garter or basketweave! Many thanks.